Many of our customers contact us as they have a VW Camper Van – their treasured possession that they want to protect securely. Most garages are not tall enough to accommodate the VW Camper, but we have the solution. At Wessex, we can supply Extra Height Garages in various heights to accommodate VW Camper Vans, Motor Homes, Caravans, Boats etc. Our large range of secure robust Concrete Sectional Garages are available in the Pent style roof as well as an Apex style. 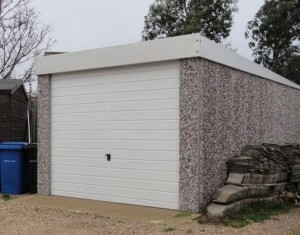 All the Concrete Garages can be personalised to suit the customer’s requirements. 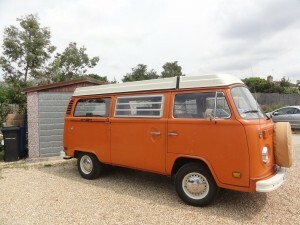 One of our customers in Poole was purchasing a 1974 VW Camper Van but her existing garage was not big enough. As soon as she had taken delivery it was measured and we looked at all the options and prepared a detailed quotation for her consideration. The old garage was removed and the base was enlarged. Our customer chose the Pent style roof with an eaves height of 7′ 8″ and an up and over door 9′ wide and 7′ 6″ high. The VW Camper Van is now securely stored in the Garage.